Bhramar Ghosh was the eldest of the children of Mr. Atul Chandra Gosh, son of Roy Bahadur Jogesh Chandra Ghosh. From Ma’s letters to BG one could conclude that Ma had her Kheyal that BG should take up the ascetic life and in a way Ma was grooming her for that. Ma in fact assumed the role of a spiritual mentor to BG. She had been given an ascetic name Yogananda.Ma also gave her a Shivalingam(Yogeshwar) for worship and named her in-house built personal temple as Yogamandir. Her spiritual inclination was unquestionable. Her sincerity in sadhana and her spiritual experience made her a special seeker. Apparently BG had all the qualities to be an ideal ascetic. But Providence had something else in store. Her family status, intelligence, educational excellence, connection with the then elite society of Calcutta only added to her inflated ego. Her love towards Ma was not associated with surrender. Besides, perhaps there was a mental conflict – taking up the ascetic life from conviction and the mundane desire to be a householder. During the second world war from fear of bombing, people were fleeing en masse from Calcutta to different safer places. BG left her teaching profession in Cacutta and joined a new school in the nearby district of Bankura, West Bengal. There she met a young and handsome civil engineer, Suhrit Sengupta, who was a contractor at the school which BG joined as the Head Mistress. To the astonishment of all the two fell in love and got married in 1939. After marriage she contracted TB and in spite of being under the care of one of the best doctors in India, Dr Bidhan Roy, she died in 1948 from pleurisy/TB. By then she had three children, two daughters and a son. The eldest daughter Chandana was 4, the son Bhaskar was 3 and the youngst daughter Anjana was 1 year old when she died. Bhramar Ghosh during the period 1934-1936. These pages consist of the translation from the Bengali of letters on Ma Anandamayi written mainly in 1925-26; they were addressed to Pran Gopal Mukerjee, who was one of the first devotees of Ma, and one of the first also to speak of her to a large audience. He had an important administrative position (Assistant Post Master General of Dhaka, the capital of present day Bangladesh) and was disciple of a well known saint, Vallananda Brahmachari of Deogarh – Bihar). The bundle of letters was given by Govind Gopal, Pran Gopal’s son and a well known pandit, to Swami Nirvanananda in Dehradun. Swami Nirgunananda (Shantivrat) made a copy of them, and translated them in March 1998 in Ma Anandamayi ashram in Dhaulchina (Kurnaon, Himalaya), where he has been living as a hermit for the past twelve years. He is among Ma’s senior disciples. The text was edited by Dr Jacques Vigne, who hails from Paris but had been living in India, especially near Ma’s ashram in Kankhal, for many years. ln April 1924, Ma and Bholonath had shifted from Bajitpur to Shahbag in Dhaka, where the latter had been appointed as the manager of the estate and garden belonging to the daughter of the Nawab of Dhaka. Ma had started her ‘play of sadhana’ where she explored all the paths of sadhana -except the left hand Tantrism- in a short period. This enabled her to guide in the course of time every sadhaka on his own path, a capacity rarely found with other gurus. She had observed a period of 23 months of silence until December 1925, and she announced in the beginning of 1926 that she wanted to keep again, for five years, a type of silence where she would not speak on other subjects than religious ones. Eventually, due to the entreaties of her close disciples and relatives, she gave up the idea. During this period and for several months, she used to eat very little: three mouthfuls of food including water on Mondays and Thursdays, and nine grains of rice only on the other days. She also gave up eating with her own hands. On January 26, 1926, Ma started becoming more widely known : a large scale kirtan was organised in Shabag by Bholanath on the day of a solar eclipse -an occasion for celebration in Hinduism. Ma entered into different bhavas (ecstasies) and for the first time, spontaneous mantras came out of her mouth in front of a large audience. A miraculous atmosphere became manifest around her, and people started flocking to her with all kinds of demands for a cure from illness and so on. The main author of these letters is Atal Bihari Bhattacharya, also referred to as Atal or Atul Babu. He was a teacher in the college of Rajshahi, a town in Bangladesh. Ma told him he was her son, but somehow discouraged his wish for complete renunciation as being premature. The other author of the letters is Baul Bashak, also called Baul Dada (Dada means ‘elder brother’). He was Bholanath’s boyhood friend, and always at hand to render service during these years. It is quite interesting to see how Ma allowed him to enact a mystical vision he had about her in reality. As a third part of this text, we added a few more questions and answers with Ma which were reported at some place or the other in the correspondence and also a hymn to the Mother composed in Bengali by Girija Shankar Bhattacharya and translated by him into English. Ma’s effect on the recipient of these letters, Pran Gopal Mujkerjee, has been long lasting. His son writes of him, after his death: “Whenever my father spoke of Shri Ma, there was a thrill of awe and reverence in his voice which remained undimmed over the years. He knew her to be a teacher who had come to show the way. He would ask her very often ’Ma, when are you going to reveal yourself?’ Shri Ma would just smile”. (quoted by Bithika Mukerji A Bird on the Wing – Life and Teaching of Shri Ma Anandamayi, Satguru Publications.Delhi, 1998). At the end of this introduction, we may mention the function of the Internet to bring quickly these genuine documents about Ma’s early years to the attention of a world audience, for the benefit of spiritual seekers, students or researchers in religions and mysticism. These letters have been dormant for the past seventy + years, were just translated in March 98 in a Himalayan hermitage, and are now on-line. This availability would have been unthinkable only a few years ago, when communication was mostly dependent on the slow and cumbersome system of publication and distribution. Ma : Do you find it difficult to do your job in Rajashahi while leaving me here? Atal Babu : Yes, Ma. Ma : But it is not possible to stay with me and to do all the duties of a householder at the same time. Should you want to stay, you will have to live in a forest like a hermit; but obviously, I must myself also try to live the life of a hermit along with you. Atal Babu : Yes, Ma, let it be. Ma : Can you endure the hardships of the hermetic life? Atal Babu : With your blessings and with you, I am sure that I can. Ma : Look, recently, you were anxious to put in order my kitchen (which was somehow not in a proper order). You always buy new clothes and care much for me. Now, what will happen if you see me dressed in bark and in torn clothes? Will you be able to tolerate all this? At that time, if you say :‘Ma, I cannot stand to see you in such an attire‘, I will leave you! Atal Babu : Ma, you’ve put me to the hardest of tests. You’ve yet to grant me the capacity to pass it. Let your will be done anyhow, but it will really be a punishment for me to leave you here while staying in Rajshahi. After this dialogue, Ma gave him advice and consoled him. One day, I, along with Pishi Ma (‘paternal aunt), Bholanath’s younger sister who was helping Ma at that time) requested Ma to die before she herself dies. Ma told Pishi Ma “You please bless me so that I can go before you and before becoming a widow.” And she told me :”How can it be? Can a son die before his mother?” I was very pleased that Ma acknowledged me as her son for the second time in her own words. At that time, I understood that she would not take her vow of silence as long as myself and Pishi Ma were along with her. Such was her compassion. Atal Babu : Ma, whatever my questions are, you always seek permission from some other person to answer them, but a son always likes to hear from his mother directly. Ma : Don’t you ask permission from your Guru to do whatever you do? Atal Babu : I do, I even seek permission from him for whatever 1 say. Ma: So, don’t utter these words ‘some other person’ (this means that not only she considers her husband as her guru, which is the custom in Hinduism, but that she sees him as not different from herself). Ma added, regarding Atal’s capacities to retain the high spiritual experiences he had. “Right now, I won’t say anything. I will answer at the right time”. Atal Babu :At least, give me your spiritual assurance (lit ‘abhay vani’ ‘word of fearlessness’). Ma later told Bholanath :”If I describe his spiritual future to Atal, he will be overwhelmed by joy and feel much encouraged”. Atal told Bholanath :”l am least interested in knowing my future. What I want is her assurance regarding my spiritual security, it may be today, tomorrow, in ten or twenty years or even after my death, but what I want is coming back to Ma’s lap”. Atal Bihari was granted permission to touch Ma’s feet whenever he came and was always eager to do so, but used to seek permission again every time. (Touching the feet means to surrender oneself to a superior, be it a parent or the guru). But once, Ma expressed her displeasure publicly about people doing so. He felt hurt. Ma took him aside in private, along with Bholanath, and explained to him the reasons for not allowing him to touch her feet, and added he should not divulge these reasons. What is remarkable is that from that moment onwards, Atal’s eagerness to touch Ma’s feet completely vanished. Near the Ramna Kali temple (Kalibari), there was an old dilapidated Shiva temple. I was going to that temple along with Ma and Sonu, Pishi Ma’s son. We playfully decided to start a race. Sonu and myself were going well ahead of Ma, and when we were about to reach the old temple; we looked back and said jokingly :”Ma, you are defeated!” To our astonishment, she started running, overtook us and reached the temple ahead of us, laughing heartily. Then we all went inside and she gave some further advice to a student who had asked for her blessings the day before to be able to pass an exam in Calcutta. She instructed him to offer hibiscus flowers to Bhadra Kali one by one, repeating his prayers to Her. it was 11 or 12 noon, and then we understood that Ma had come all the way here only to grace this student. The same evening, Ma returned to Ramna Kalibari with a few devotees. The manager of the temple, Nityananda Giri, had had some dispute over the endowment of temple properties. He had asked Ma about the auspicious time to file a suit. That evening, she advised him to start it in the month of Magh (after January 14, the beginning of the six auspicious months of the year according to Hinduism). All of a sudden, Ma started shouting :”Where are you all!” We were startled to hear such shouting. 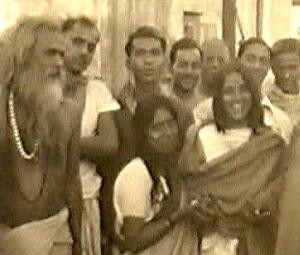 Then, addressing Nityananda Thakur, she added :”You cannot keep me here anymore. For some time, I will leave this place and stay in Shahbag (Ma and Bholanath’s place). You may go there if necessary, but I won’t come here.” Ma was telling this with a really harsh voice. Then she burst into a violent peal of laughter and came out of the temple. She was waving her hand as if throwing out somebody and was telling :”Go, go!”. Then she went inside the samadhi temple (tomb) of a saint which was located in the courtyard and instructed us to go back inside the main building since she would be late coming out. 4. Baul Basak is allowed by Ma to enact his vision. In deep meditation, Baul Dada saw himself making circles around Ma’s head with Shiva’s trident (trishul). He told Ma about this vision. While everyone was discussing this Pishi Ma said to Bholanath “I will put a trishul in your hand” and Ma approved. The next day, at 10 am, when Baul Dada came to Shahbag, Ma immediately asked him to go to Siddeshwari temple to a certain Bairavi (a tantrik female ascetic) to get a trident from her. On the way we bought offerings of flowers and fruit. Because the main temple was crowded, we decided rather to offer the items to Ma’s mahasana (a small platform especially built, for Ma in Siddeshwari courtyard). We took the trident of the Bhairavi, placed it on Ma’s mahasana, worshipped it and returned to Shahbag with it. On the way back, Baul Dada kept on singing Shambu’s (Shiva’s) praise. We put the trident in Ma’s bedroom. In the evening, I placed two asanas down (small carpets for meditation), requested Bholanath to sit on the right one and Baul Dada asked Ma to sit on the left one, though she protested jokingly saying: “I feel very weak, I cannot get up from the bed”. We could clearly understand that Ma was in a special spiritual mood (bhava); all her limbs were stiff. After some time, she regained her normal state and sat on her specified asana. Seeing that Pishi Ma was bringing the trident from her room, she said, making fun of the situation: “I am frightened to see you thus. Will you strike me?” At this time, Pishi Ma was looking just like a bhairavi with the trident and her face had an awe-inspiring glow. She put it in Bholanath’s hand, then got absorbed in deep meditation for some time. Bholanath gave the trident to Baul Dada, who started moving it in circles over Bholanath’s and Ma’s head, while singing Lord Shiva’s praise. It was as if he was possessed by some holy madness (in fact. Baul in Bengali means crazy, often for God). After some time, Ma told him “Now, you understand why there is a trident in the hand of Lord Shiva”. Incidentally, a few days back, Baul Dada had asked this question to Ma and she had not given any answer. Then Baul Dada explained:”Lord Shiva is the great God (Mahadev, a name used for Lord Vishnu as well, the preserver of the universe), the great Time (mahakal, means the great Destroyer) and the creator of the Universe (an allusion to the essence of Shiva as being above the manifested trimurti of Brahma, Vishnu – and Shiva as simply destroyer). He holds in hand Nature (prakriti) in the form of a trident. The trident stands for the three attributes of Nature (i.e., the three gunas). It is always striking at the world, hence the sorrow. He further added “Kashi (the ‘shining one’, the traditional name of Benaras) is Shankar’s (Shiva’s) capital and is placed on the trident, which means that it is not a part of the universe. This kingdom is beyond the gross world, in it there is neither pleasure nor pain, that’s why there is no earthquake in Kashi. In this microcosm which the body is, the five elements and the three gunas correspond to the five interior chakras and to the three nadis, ida, pingala and sushumna. The eyebrow chakra (ajna) is beyond them, it is called by tantric practitioners ‘Kashi’. When the mind is stabilized in this chakra, there is ‘no earthquake’, i.e., mental and emotional disturbances subside”. Ma approved of these explanations. Ma evokes her own experiences. In Siddheshwari, the devotees had built a small cemented platform for Ma to sit on while being there. They wanted to consecrate it during the nine days of the Durga Puja festival in 1925. They had prepared a meal (prasad) for about a hundred people, but more than three hundred of them turned up. Yet, after everyone could have their fill, there were still some leftovers. Then, Ma evoked her own spiritual state: “When waking up after quite some time, I am quite oblivious of the world outside, of where I am, whether on the ground, in water or in air, of what type of room I am in, whether a building or a hut, where the doors are, whether it is day or night, and whether there are people or not surrounding me. After a long time, the outer perception becomes clear again. Many a time, I just lay down with inert body. I do not have any special perception of my body parts like hands, feet, eyes, ears or mouth. It feels as if a small lump clay is just lying there. Inside, I feel just like clean and solid glass where no stinking smell or putrefied air can enter. If they somehow manage to get in, it is very difficult to get rid of them. I cannot do anything against it on my own. Should I be forced to do anything in that state, I feel pain. It seems that it is better not to take any food. If I do so, I feel a burning sensation in my body, profuse sweating and impaired breathing. If in that state someone is calling me, it seems as if a person is striking hard on my head. If I respond to anybody’s call at that time, I may go mad. Those who are trying to proceed towards God should refrain from criticizing and speaking ill of others. If you see someone, you should not try to label him as good or bad. The attraction towards God of those who do so will be weakened and they will be tempted to glorify themselves. One should better look within. How can we get rid of the sense of ‘me’ and ‘mine’ (‘amar’ in Bengali)? Ma: Delete this ‘a’ at the beginning; what remains is ‘mar’ (lit ‘belonging to Ma’, ‘of Ma’). Let the five senses and the five organs of action do their work, but stay put on the Name; then, your ego will gradually diminish. When you feel that the recitation of the Name is going on spontaneously from within, the ego will decrease as well. Ma, you have reached the culmination of sadhana. Is there any necessity for you to observe these strict rules? I just have to stay in this world. Self-restraint is necessary so that the ego does not get the upper hand. (Ma wants to set an example for others as well). Ma, in a special mood (she had been addressed by Nani Babu directly as the Goddess):”I drink my own blood (a reference to the famous representation of Chinnamasta ‘the one with her head which is severed, who actually drinks her own blood while at the same time giving a part of it to Jaya and Vijaya). I am nirahara (which may mean I do not take any other food, or else I have not taken any food, hence I am hungry). I am the whole world in its entirety. Why do you have so much greed for blood sacrifice? To me, everything is equal. What is sacrifice? What is not sacrificed? Why do you pluck flowers and fruit from the tree? Why do you take vegetables from the fields? Whatever you are taking is only sacrifice. The presiding deity (Chinnamasta) is drinking her own blood. She is taking everything in and giving everything out. By Girija Shankar Bhattacharya (who was originally from Ashtagram and Professor in Calcutta,). This hymn was written in 1943 first in Bengali and then translated by the author himself into English..
1) I bow down to the Blissful Mother of the Universe (Shree Shree Anandamayee) again and yet again do I bow down to her, whose irradiant smile dispels all mental darkness: whose sweet words attract all: and who by her affection makes everyone her own. 2) I bow down to the Blissful mother of the Universe (Shree Shree Anandamayee); again and yet again do I bow down to her. whose mysterious life (literally the truth about whom) is beyond the comprehension of human beings: and who, though living always without any break in the bliss of Brahman, moves about free, for the good of the downcast, as a veritable mother, full of infinite patience and infinite readiness to pardon transgressions. 3) I bow down to the Blissful Mother of the Universe (Shree Shree Anandamayee) again and yet again do I bow to her, whose mercy is my only hope: who, in her infinite graciousness, manifests herself even in minds prone to evil thoughts and fills them with ecstasy; and utter surrender to whom, together with all near and dear ones, is the only duty of sensible men. 4) To Bholanath do I bow who has a body of bliss (or who was a second Nityanand, (Chaitanya Mahaprabhu’s main disciple) and I bow to the Supreme Bhakta who has obtained Unity with the effulgence of Brahman (or to the supreme Bhakta Jyotish, i.e. Bhaiji, whose first name signifies literally ‘God of Light’).